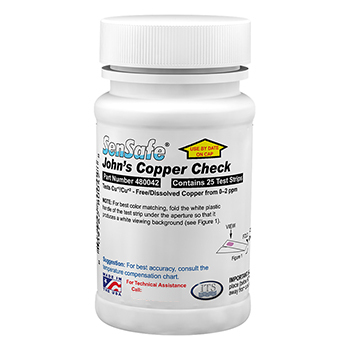 John's Copper Water Test Kit is designed for easy dip-and-read test to determine concentration of copper in water. It is a low cost alternative to wet chemical tests.Testing is done using test strips with a reagent that reacts with copper in water. Results in 1 minute, detects 0 - 2 ppm (mg/L) of copper, which is typical levels of copper found in well, tap and stream water. MSDS is not required, test strips are safe and easy to use by anyone. Just dip strip into 200 ml (about 7 oz) of water sample for 15 seconds in a sample with constant back and forth motion, then remove strip, wait 30 seconds, match to the color chart.